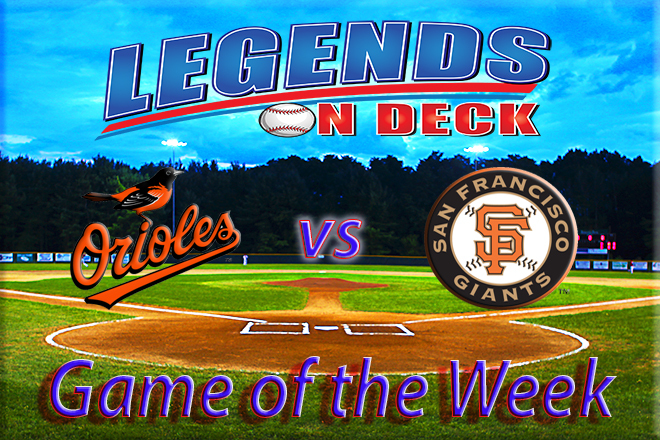 The Baltimore Orioles visit the San Francisco Giants for the Legends on Deck game of the week. Both the Giants and Orioles are fighting to maintain their respective division leads. The Giants (65-49) currently rank first in the NL West. They hold a slim one-game lead over the Los Angeles Dodgers in the divisional race. Meanwhile, the Orioles (64-50) have led the AL East for much of the season. However, they now trail the Toronto Blue Jays by a half game. The Boston Red Sox are also just a shout away from the top of the AL East trailing the Jays by three games. San Francisco and Baltimore enter the game of the week having similar outcomes in their last ten games. Both clubs have five wins and five losses. Each club will look to change their fortunes in the upcoming series. With the Orioles and Giants in tight divisional battles, each series for the remainder of the season will be very important to keep these clubs in the hunt. Baltimore’s Dylan Bundy will get the start on Friday evening. The 23-year-old has been impressive in recent games with an overall record of 5-3 and 3.05 ERA in 65.0 innings pitched. Bundy has won his last two starts. During that span he has allowed five hits and two earned runs in 13.o innings. Bundy also notched nine strikeouts in his last start against the Chicago White Sox which was a career high. Matt Cain will be the starter for San Francisco on Friday evening. On the season Cain has a 4-6 record but he has pitched well during his last two starts. During his last two starts, Cain has allowed just five hits and zero earned runs in 10.0 innings. Cain recently earned his 100th career win. He will look for his fifth victory of the season in the game of the week against the Orioles. Friday night’s game will be Baltimore’s eighth consecutive road game. The club will play a total of ten road games before returning home to Camden Yards for an important divisional series against the Red Sox. The O’s have struggled on the road with just a 25-33 record on the season. The Giants return home on Friday for the first time in nine games. The Giants have been very successful at AT&T Park this season with a 32-21 record. Brandon Belt leads San Francisco with 13 homers on the season. Shortstop Brandon Crawford has 71 RBI which is tops for the Giants. In addition, Crawford’s home run in the fourth inning was the lone score his club’s recent 1-0 victory over the Miami Marlins on Wednesday night. There are six players in Birdland that are ahead of Belt when it comes to home runs. Mark Trumbo leads the pack with 32 home runs this season. Trumbo also leads the team with 82 RBI. Despite putting up big numbers, Trumbo and teammate Chris Davis have struggled since the All-Star break. Baltimore will need more consistency on offense to stay in the divisional hunt. This is especially important considering the team’s starting pitching struggles throughout the season. Friday’s game is scheduled for 7:15 pm Pacific time at AT&T Park.